Shaving creams tend to be heavily scented. Some men enjoy the strong fragrance, while those with sensitive skin may have difficulty with it. An average tub of quality cream ranges from $15-$35 depending on the brand, and will last for approximately two months of daily use. 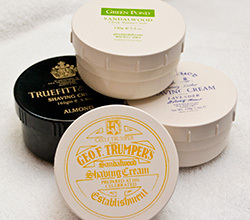 Shaving soap offers a rich and stable lather against the skin, but it is sometimes difficult for a beginner to lather. Triple-milled soaps that offer the best shave have a very hard texture that requires more work from the shaving brush to generate lather suitable for shaving. Shaving soaps work best with brushes with that are more densely filled with badger hair that have a stiffer feel to them. Lathering technique varies from soap to soap, so a shaver has to experiment to get the right lather; however, once you achieve a proper lather from the soap it could give you better cushion than a shaving cream. It is for this reason that many straight-razor users prefer soaps over creams. 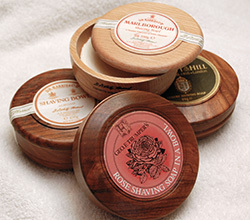 Because they are more subtly scented, shaving soaps may be a better choice for people with sensitive skin. However, a shaver with dry skin may have to experiment with different brands to find the right one. Many men like the lighter fragrance so that it doesn't interfere with their aftershaves or colognes.